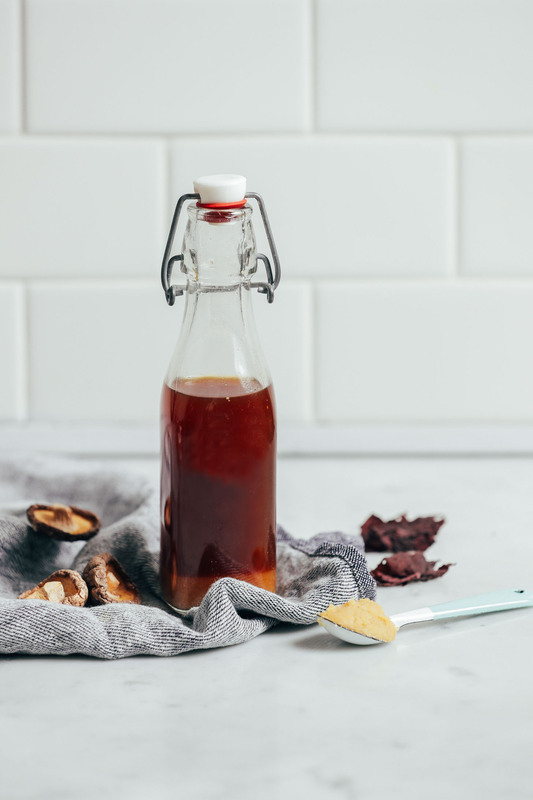 Fish sauce is a popular Asian condiment that imparts a salty, robust, ocean flavor that can make a great dish taste even better! It is commonly used to add depth of flavor and saltiness to dishes such as ramen, stir fries, marinades, dipping sauces, and more. While coconut aminos can make a close plant-based substitution, sometimes you just need that extra “fishy” flavor to send a dish over the edge. So, we developed a vegetarian-friendly fish sauce of our own! This 20-minute, 5-ingredient, 1-pan recipe is a pantry staple we highly recommend keeping on hand for Asian-inspired dishes and beyond! 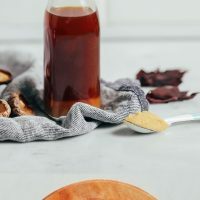 This sauce starts with combining ingredients with an earthy, ocean flavor (dulse & dried shiitakes) with water and salt to get that distinctive fish-sauce base. Plus, dulse — a.k.a. Atlantic seaweed — is rich in iodine and contains important nutrients such as B vitamins, vitamin C, manganese, vitamin A, copper, protein, phosphorous, iron, and zinc. Winning! Next we pour the liquid through a fine mesh strainer and press down on the mushrooms and dulse to get all the water out. Then we stir in chickpea miso and tamari for extra saltiness and depth of flavor. And it’s that easy! & Perfect for Asian-inspired dishes and beyond! Looking for ways to use your sauce? We would suggest adding a splash to our Singapore Noodles, Tom Kha Gai Butternut Squash Soup, or Easy Ramen. More recipes featuring this versatile sauce coming soon! 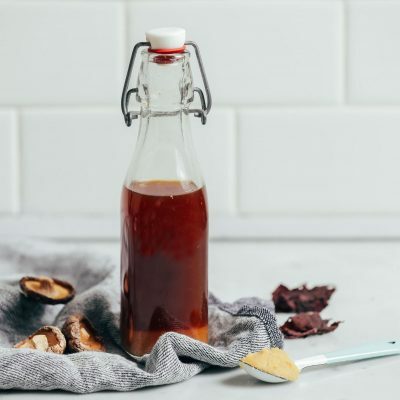 Need a plant-based substitute for fish sauce? This is it! Just 5 ingredients required, ready in less than 30 minutes, and perfectly salty and tangy. Great for Thai-inspired dishes and beyond! 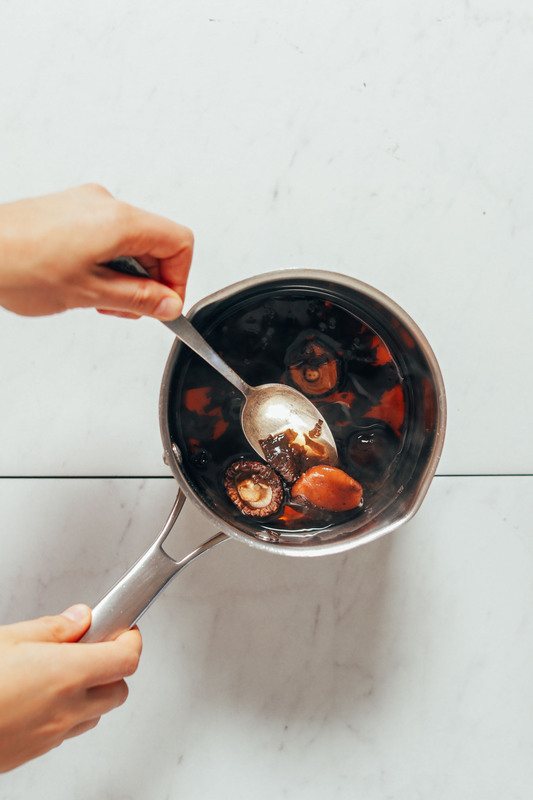 To a small saucepan, add water, dulse, dried shiitake mushrooms, and sea salt. Bring to a boil, then cover, reduce heat, and simmer for 15-20 minutes. Remove from heat and let cool slightly. 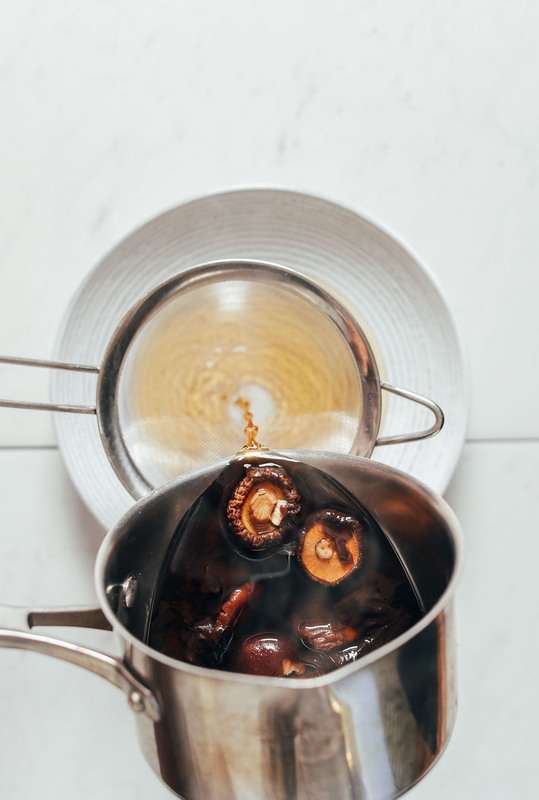 Pour liquid through a fine mesh strainer into a bowl, pressing on the mushrooms and dulse with a spoon to squeeze out any remaining liquid. To the bowl, add chickpea miso and tamari. Taste test and adjust as needed, adding more sea salt for saltiness, chickpea miso for umami flavor, and/or tamari for depth of flavor. Store in a sealed container in the refrigerator for up to 1 month and shake well before use. Or, pour into an ice cube tray, freeze, and store in a freezer-safe container for up to 2 months. *Nutrition information is a rough estimate calculated with lesser amount of tamari. Takes me to umami heaven! Can’t wait to try this in your Pad Thai recipe next. I love when you create these 1-2 combo recipes, Dana. Why is this called vegetarian instead of vegan if it’s vegan? Why would call it vegetarian when it’s in fact also vegan? I can’t wait to try this recipe! I have so many allergies that my diet is very boring. Most fish sauce has Shrimp as the main ingredient. I am deathly allergic to Shrimp so I thought that was a flavor enhancer that I would have to forgo. Thank you for sharing your knowledge with the world. Thanks for sharing! Hope you love it. Hi Dana. How long will this sauce keep, and about how much does it make? I know you typically don’t use much fish sauce in recipes – is this a 1:1 replacement? Lisa, you can find that information in the recipe box! The company for the dukes is Maine Coast, not Marine. They have the absolutely best seaweed. It’s probably the auto correct. It changed my comment from dulse to dukes. Not really helpful there. Why don’t you recommend tasting fish sauce? I love your recipes and enjoy following you on social media. But as someone who grew up in a culture that loves fish sauce, I am disappointed and saddened by your intro line. Your entire post thereafter feels like cultural appropriation. You don’t recommend tasting fish sauce, yet you created a recipe that mimics its flavors. Ironic much? Please understand that I am simply pointing this out to share how a few words, without forethought, can make others feel. I hope that your future posts will be more mindful of this fact. Thanks for sharing, Amy. We will be more considerate of that in the future. I am SO happy you posted this. 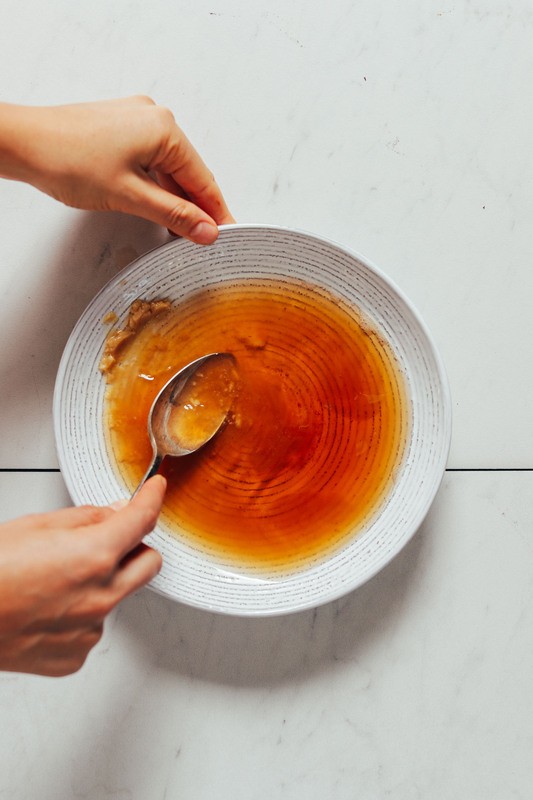 I’ve scoured the internet for veg versions of fish sauce and have found very little, and there are some recipes that seem like they just aren’t the same without it. Can’t wait to try this. What makes this vegetarian vs vegan? Why is this vegetarian and not vegan? Thank you for posting this gem! Can’t wait to try it in my Thai dishes. Hi! I’ve been looking for an easy veg fish sauce forever, so this is perfect! One question: I have kombu; is that an acceptable substitute, or should I spring for the dulse? Just curious how long this will last in the fridge and if it can be frozen? Thanks! This is freaking brilliant!!! I can’t wait to try this in my thai noodle soup!! Hello, I can’t eat mushrooms. What would you use instead? Hoping you can suggest something as I really want to make this sauce! Thanks. Why did you name this sauce vegetarian as it is vegan? I’m so happy to see a vegan fish sauce recipe! I have a lot of kombu in my cupboard – can I sub that for the dulse ? I’ve been using fermented black bean garlic sauce in place of fish sauce for years. I hope this is a better substitute. 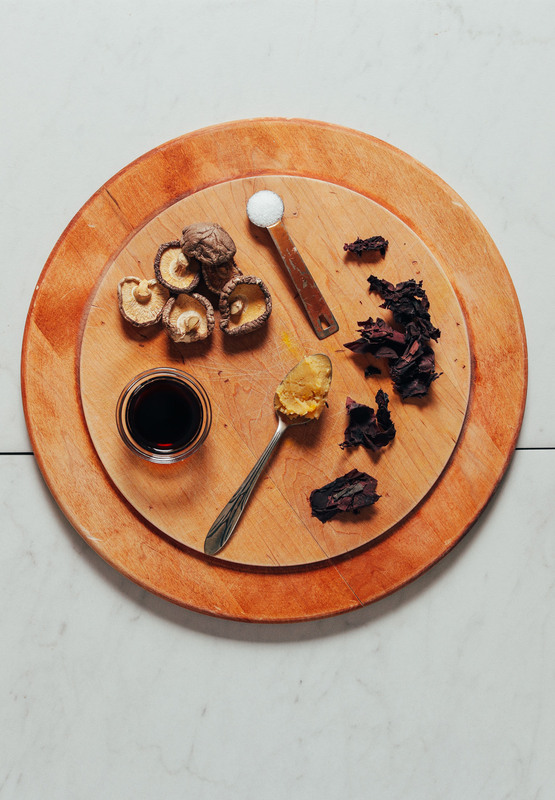 Question: instead of squeezing out the mushrooms and dulse, what about pureeing in a blender? This is really cool! Something about regular fish sauce grosses me out even though I eat fish. I normally just use vegetarian fish sauce from the Asian store but this is way healthier! I’m gonna give it a go and use it for pad thai! Hi Dana. I’ve never used dulse before. I see it is sold in several different forms. What form do you recommend? Thanks. We typically find it at Whole Foods! The brand is Maine Coast Sea Vegetables.